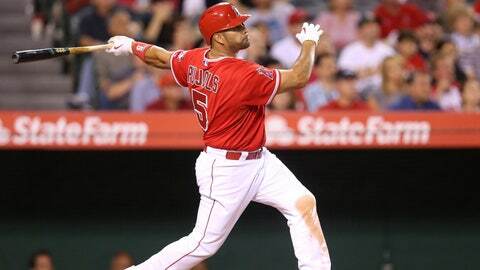 Albert Pujols admires one of his homers during the 2014 season. In the 145-year history of Major League Baseball, only 25 players have emassed 500 careeer home runs. As the Angels slugger closes in on 500, join the FOX Sports West/Prime Ticket conversation by sharing photos, videos and tweets using #Roadto500 during his run at a major career milestone. "We have a great team that can do a lot of things, but we’re not looking to win the home run title in the American League," said Pujols, after the Angels hit five HRs to beat the Mets on April 13. "Our goal is to try to do our job and win."